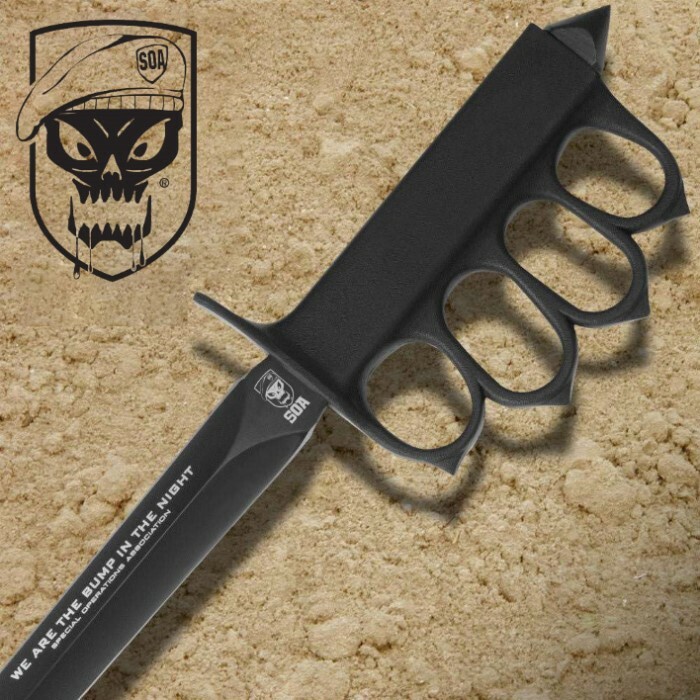 United Cutlery S.O.A. 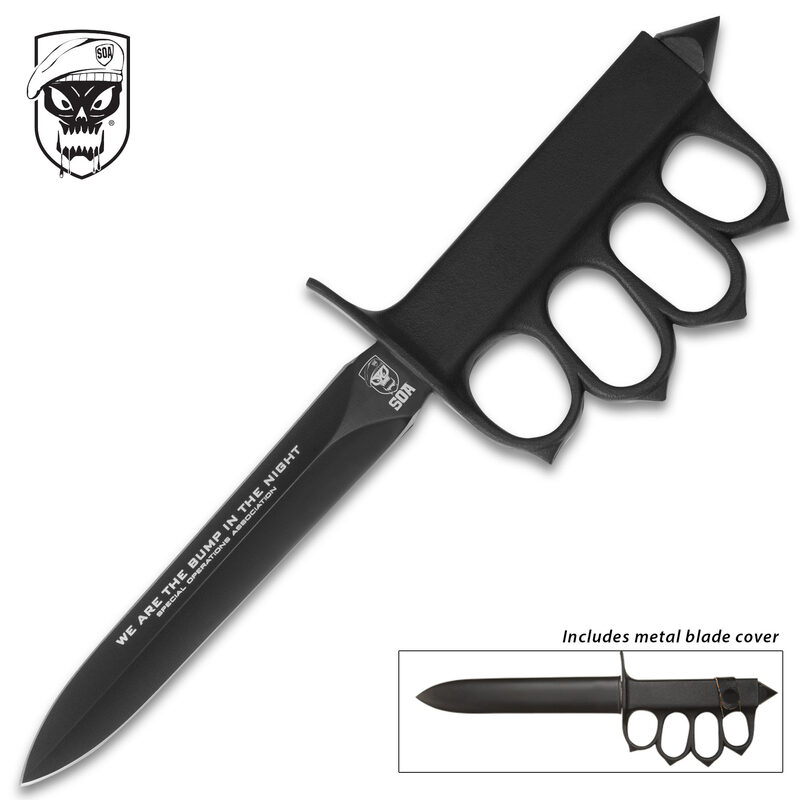 “ We Are Bump In The Night ®” WWI Trench Knife | BUDK.com - Knives & Swords At The Lowest Prices! The battle-hardened trench knife was birthed from the brutal trenches of WWI. Each knife features a strong cast metal, knuckle guard handle with spikes on each knuckle for deep-penetrating punches. A metal skull-crusher spike is attached to the pommel as a last-ditch defense mechanism. A razor-sharp, double-edged 6" AUS-6 stainless steel blade is coated in a durable, corrosion-resistant, non-glare finish and offers an exclusive S.O.A. laser etch on the blade. Good price for this knife. Keep in my auto and gear bags, just a little sharping makes this knife ready to go. This is one of the two trench knives I bought on this sight. Definitely worth the price, comes a little dull but once sharpened you will be fine. Definitely a conversation starter and a good center piece. In my opinion it is very well built and sturdy. I bought 2 of these in BOGO sale. I have to say for the money this is a good product. Yes the blade needs sharpening. The aus 6 steel is descent unless you are stabbing a rock. I tested on wood, and meat with bone and the blade performed well. No bend or breakage. If the blade got below about 10 degrees it would crack as cold tends to do that with aus 6 steel. The worst part of the package is by far the strap loop. this is very thin and snapped off my belt with minimal effort so keep that in mind when you carry in woods. I could see it being lost quickly in even thin brush. I riveted in nylon strapping to fix. The sheath is good and tight. I disagree with other reviews concerning a thin or loose blade as mine was fine. Perhaps an improved lot run as of lately. Finger holes are good size. I wear a large glove and fingers fit fine. I own many knives and can say I was happy with this one. Great Value for the Money asked. very good knife, though the belt loop and handle are trash, the sheath holds the knife tight in place. the holes for your fingers are small. I am a small guy with a large knuckle that will not go in easy, have to go in side ways. the blade was not sharp, it is now. over all, it works. This is a pretty amazing knife for the money. The kubaton point in the pommel could crack a skull like it was nothing, and you would not be getting back up if you were punched in the face with this thing more than a few times. The blade is, as the other reviews have said, pretty bad, but not terrible. It's about as sharp as a butter knife, but it's very very pointed and sharp in that respect. Definitely a stabbing knife if it were used for anything, although still pretty flimsy, with a millimeter or so wobble back and forth. Still a good knife in my opinion. Very tough handle and spike located on the bottom of the handle, The blade however Is very thin and makes the knife really unbalanced, Perhaps 1/16" added to the thickness of the blade would help. Other than that I am very pleased with this knife for $20 Thanks BUDK Rich. This is a great knife that is able to be looped onto my webgear belt. That is a major plus because of how often i use my web belt to go on hunts and so on. Great quality steel, but the paint scratches off kinda easily.. but i really dont care. Great knife altogether! Oh, and make sure the skull pommel nut is tight, because that holds the blade in the handle. Let me start off by saying that this blade is NOT meant for any kind of tactical, defensive, or practical use whatsoever. This knife is replica, a wall ornament at best. That said, it is worth purchasing for any collector/knife enthusiasts. The knuckles are heavy and function as well as hunk of metal should, but the blade is low grade (yes, AUS-6 is fairly low grade) steel. Price 5/5 Style 5/5 Function 2/5. Overall, a worthwhile purchase.